I've been doing my research over the last few months on the best solo 401k providers for small businesses and side hustlers like myself. I've shared in the past the best options for saving for retirement with a side income, and I've leveraged a SEP IRA in the past. However, as the side business income has grown, a solo 401k is a better option for sheltering more money for retirement tax free today. One of the big reasons I've opted for a SEP IRA in the past is that it's very easy to setup and my income wasn't really high enough to justify a solo 401k. Today, however, I'm willing to accept a little more paperwork to save a lot more in taxes. Even after contributing for a few years, I've actually found that there isn't that much extra paperwork - it's very similar and when you open the account at your brokerage, you can't really even tell the difference. So, let's get started and look at the Solo 401k. You might be asking why I'm considering a solo 401k versus a SEP IRA or other self employed retirement savings options. Well, it all comes down to circumstance and how much you can save. Let's look at two scenarios that are similar to mine. First, in the past, I only saved in a SEP IRA because my income was lower and I was still maxing out my 401k at work, so I didn't need any additional employee contributions. With both a SEP and Solo 401k, on $30,000 of income, the employer contribution is $5,576.11. Since I was already doing the $18,000 at my primary employer, that amount didn't make a difference. However, fast forward to today, the business makes much more income, and my wife is now working for the business. As such, it can make a huge difference in savings and lowering our taxes. Let's assume that the business is going to make $100,000 this year. That means that the business can contribute $18,587.05 to both my 401k and my wife's 401k. Plus, my wife can contribute $18,000 of her salary to the 401k as well (since I still make my $18,000 at work). As such, the solo 401k provides much more savings options, and lower taxes today as a result. Going through the process of shopping around for a solo 401k provider, I've learned a lot about what to look for. There are a lot of options and nuances that you should look for when shopping for a 401k. Many of the "free" providers offer simple generic plans, and if those don't work for you, you can have a third party provider create a custom 401k plan for your business, which you can then take to a brokerage. Whoa, that sounds confusing, and it can be. So let's look at the major options that you need to consider when selecting a solo 401k provider. Does the 401k provider offer both Roth and Traditional contributions? Does the 401k provider offer loans from the plan? What types of investment options are allowed in the plan? Does the provider allow rollovers into the plan and rollovers out of the plan? Based on your wants and needs, there are a lot of things to compare when shopping for a solo 401k provider. Let's compare some of the main firms that offer solo 401ks. We're going to start with the 5 major firms that provide Prototype Plans. These are the "free" plans that the companies advertise. So I was disappointed to learn that Fidelity doesn't offer a full service solo 401k option. Their current "free" solo 401k doesn't offer a Roth contribution option, and it doesn't offer 401k loans. Speaking to their representative, they told me this was to save costs on maintaining the plan since they don't charge to setup a solo 401k. However, because it is Fidelity, they do offer a full range of investment options, from commission free ETFs, to mutual funds, stocks, bonds, and more. The Fidelity solo 401k is cheap. There are no setup fees or annual maintenance fees. And trading within the Fidelity solo 401k is the standard $4.95 commission. They also have almost 100 fee free ETFs that you can trade commission free. That's why we believe Fidelity is one of the best free investing brokers for long term investors. Note: A big drawback with Fidelity is that you have to mail in a check for your contributions...seriously?!?! Learn more about Fidelity in our Fidelity Brokerage Review. 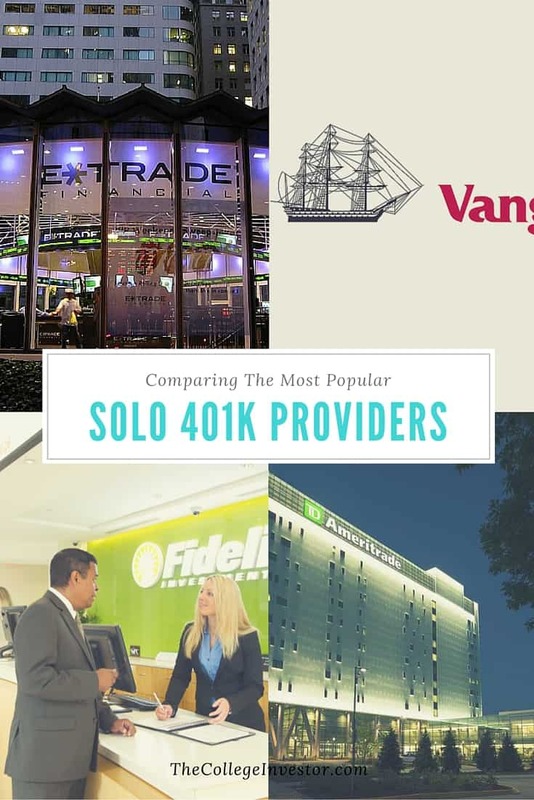 Vanguard is one of the most popular solo 401k options because Vanguard has always been synonymous with low fees. As such, I expected them to be a very low cost provider. Vanguard only allows participants in their solo 401k to invest in Vanguard mutual funds (not even Vanguard ETFs). This limits investment options quite a bit. A big benefit that was announced in November 2018 is that Vanguard is not only lowering the minimums on their Admirals Shares, but they are also making them available in their Solo 401k product. Surprising this wasn't done sooner, but if you have investors shares, and they qualify for Admirals shares, they will convert in January 2019. Learn more about Vanguard in our full review. Schwab is another discount brokerage that offers a prototype solo 401k plan for free. Since Schwab is continually working to improve their image in the low-cost brokerage space, I was interested to see what they offered. ​I was disappointed to learn that Schwab only offers traditional 401k contributions - they do not have a Roth option on their plan. They also do not offer loans under their plan. It appears that you can rollover a 401k into your Schwab solo 401k, but you cannot do an IRA rollover. Schwab does offer a lot of investing options, including Vanguard mutual funds and commission free ETFs. There are no fees to open the solo 401k, and there are no yearly maintenance fees. Inside the 401k, traditional Schwab pricing applies - $4.95 per trade, with $0 on Schwab funds and ETFs. Learn more about Charles Schwab in our Charles Schwab Review. When I started looking for solo 401k options, E-Trade wasn't really on my mind. I think of them as a trading brokerage, as their fees on many products are higher than I would want. However, a friend of mine said good things about their solo 401k option, so I checked them out. And honestly, I was impressed. E-Trade offers both Traditional and Roth contributions to their solo 401k. They also allow loans under their plan. They accept rollovers of any kind into the plan, and you can even setup your plan to allow in-service rollovers out of the plan (that's rare, even for traditional 401ks). This is the only plan that I've seen that even allows you to modify their prototype plan to allow in-service distributions. It's not a boiler-plate option, but you can add it as a provision at the end. Speak to your advisor when signing up for the plan and they can assist. This is what can allow you to do a mega backdoor Roth IRA. There are no setup fees involved with setting up a solo 401k at E-Trade. Inside the 401k, you're subject to the regular commissions at E-Trade, which is currently $6.95 per trade. However, they do offer a large amount of no-fee mutual funds. Learn more about ETrade in our Etrade Review. TD Ameritrade is another low cost brokerage that offers a prototype free solo 401k plan. Their plan is the hardest to dissect, but here is what we could gather.​ However, after discussing their plan with them, here is what we found. The TD Ameritrade solo 401k plan does allow both traditional and Roth contributions. They also allow loans from their solo 401k plan. We couldn't get a clear answer on what types of rollover options they allow into and out of their solo 401k plan. Looking at their plan document, they only allow rollovers from 401(a), 401(k), 403(a), 403(b), 408, and 457(b) accounts. They also offer a lot of investment choices within their 401k plan. For example, they offer Vanguard ETFs commission free. There are no setup fees or annual account fees with TD Ameritrade's plan. All regular trades within the 401k are subject to their standard commission with is $6.95. However, even beyond the Vanguard ETFs, they offer other ETFs commission free as well. Learn more about in our TD Ameritrade Review. Sorry, the chart doesn't display on mobile. Some notes: Vanguard's annual fees can be waived over $50,000 in assets. Also, all of these companies offer commission-free ETFs, so you could potentially invest for free within your Solo 401k. Vanguard also have a very odd pricing schedule. While they do offer their own products commission free, if you want to buy other stocks or ETFs, you'll pay anywhere from $2-$7 depending on how much in assets you have. Now you can see why the choice of solo 401k providers is so difficult. Each firm has strengths and weaknesses, and the selection depends really on what matters to you. And if none of these really excite you, you can always create your own solo 401k with a third party provider. You want to invest in alternative assets such as real estate, promissory notes, tax liens, precious metals, and more. We're not going to go in-depth on these providers because this section effectively becomes al-la-carte with what you can get and pay for. I just wanted to list some of the most popular third party plan providers that you can reference in your search for the best plan. This isn't an exhaustive list. There are also local firms in most areas that can create 401k plan​ documentation as well. If you're considering a solo 401k for your small business or side business, really consider the benefits that are important for you. For me, having a Roth option was very important because I want to be able to get tax diversification when I retire (I'm looking to have a lot of pre-tax money, and having post-tax money will be nice). I also want to have low costs but a lot of investment options. With everything said above, I went with E-Trade for my solo 401k. The service has been top-notch, and I've been very happy with them. Have you explored Invesco’s Solo K? Both offer full-service 401k plans and no asset minimums with access to loans, ability to rollover IRA’s and ROTH is available. There is a $15 annual account fee, which is waived @ $50,000 and you do have to pay an entry fee or sales charge – ,but there are no trading fees. So you can dollar cost average $18,000 in 1 payment or 200 equal payments of $90.00 at the same exact cost. This feature alone made it worth the sacrifices (no access to ETF or outside funds) – especially since volatility has been in vogue the past 18 months. Their funds are ok to great, you need to pick and choose. For example, they have an equal weight S&P 500 fund that does the job at low fees vs some of their domestic funds. On the other hand, some of their international funds have done quite well, so you get what you pay for. Thanks for sharing this option. It looks like higher cost than ETrade, with less options for investments (and higher costs for investments). What benefits have you found with it? Zero trading fees at all, so I am not punished for dollar cost averaging. Also, choice is a plus and minus. This is a retirement plan – if you hold the right funds for more than 5 years, many do what you need in terms of diversification. For example, check out their Charter Fund, Diversified Dividend, Comstock Fund and Equally Weighted S&P fund… all beating their benchmarks – over the long term and also YTD. Look abroad, their Developing Markets fund does a better job of active management. BTW, if you can get R shares, there is no commission to pay. I do agree that if you want choice as in the option to buy individual stocks and ETF’s… Invesco is not the plan. But it is a robust deal. Invesco now offers R Shares and T Shares to avoid or eliminate the sales charge. Their funds are doing well and there are several low fee ETF-like options too. I like having no trading fee for the frequency of contributions or dollar cost averaging over a fee for trades. Happy Thanksgiving! Does any one of the highlighted Solo 401ks offer 1) after tax contributions (non-Roth) in order to take advantage of the Mega Back Door Roth, and 2) ability to roll over a Traditional IRA into the 401K in order to take advantage of the regular Back Door Roth. Thanks!!! Yes. I believe that Etrade allows you to allow both when you setup your plan. I am not an expert but I have done extensive research on the big firms for a Solo401K and from what I have found noe offer the (2) key features you need to do a “Mega Backdoor Roth”. Those features are 1) plan must allow for non-Roth after-tax contributions and 2) not an absolute requirement but pretty much essential is the allowance for a “in-service distributions”, this allows you to take money out of the after-tax 401k and move it to your Roth 401K or Roth IRA, the is the step that actually, get the money into your Roth (IRA or 401K). This second feature is actually the easy one to find most third party plans offer it and as mentioned above ETrade offers it in their solo401k plan, but E-trade does not allow for non-Roth after-tax contributions which is the hard feature to find at the big investment firms (Schwab, Vanguard, Fidelity, etc.). My research found that only third party plan companies like MySolo401K, where you can tailor the plan documents to exactly what you want allow for the non-Roth After tax contributions. I guess the big firms have decided not enough people know about the Mega backdoor Roth or they think it will go away soon for these companies to invest in creating this plans, which is a bummer because a big brokerage house could set this plan up once and provide it to the masses at a really low cost. So in order to do the Mega Backdoor Roth , I have only found third party Solo401K providers to offer the critical non-roth after-tax contribution feature. The In-service distributions feature most offer at least one a year and MySolo401k company allows you to do as many as you like. Not a big deal for me. because I’ll only do one a year,just to keep it my plan tracking simple. The downside is that these 3rd party providers all do custom plans so they cost more, you have to decide if the extra cost is worth it to be able to put more money that the current 2017 IRA limit of $5,500/yr for those under 50 yrs old. You are still limited by the IRS to the $54k annual ceiling to the plan, but that is a long way from the $5.5k max using the Roth regular front door method. Good luck to all and happy early retirement to all! One detail I forgot to mention. The in-service distributions allows you to move your non-Roth after tax contributions to your Roth while you still work for that company, that is the “in-service” part. Otherwise you would have to wait until you leave that firm to take that money out and roll it into you Roth IRA or 401k. In my opinion even it the plan doesn’t offer in-service distributions (and most custom plans do), it is still worth it because you can massively stash cash into your Roth that you otherwise couldn’t, because of the front door IRA limit of $5.5k/yr. The only down size is that you are still on the hook to pay taxes on any growth that money made while it sat there. Hence the beauty of in-service distributions you can move that money into your Roth immediately or at least once a year and the growth is minimal or non-existent. The added benefit for early retirees is the Roth contributions can be taken out before 59.5 ys old without any penalties. Some would say if you need to take money out before 59.5 y.o. maybe you don’t have enough stashed away, but when you are about to stash $35k ($54k (IRS limit)-$18k (pre-tax limit)=$35K) a year away you could have a big chunk of change in your Roth that you might want to access pre 59.5 year old. Just a thought. E*Trade does allow non-Roth after tax contributions, it but it’s not a boiler option. You can add it in manually in your plan documentation when you create it. Since these are all self-managed, the onus falls on you to keep track of everything diligently. If you’re not sure about it, it’s probably better to go with a third party. Thanks for the helpful guide. Was on the call with E*trade solo 401k specialist, and he doesn’t know of a non-Roth after tax contribution feature. Were you able to do it? If so, could you share the related plan documentation you used? Thanks again. You would add the language allowing non-Roth after-tax contributions on the “Prior Plan Document Provision” section of the application. The language can be found on other plan documents you might have – specifically MySolo401k or similar. You could also have an attorney draft the correct language. I didn’t personally do it as I don’t need it. However, I’ve seen others do it. Thanks for the post. A few thoughts and questions. Does the Fidelity account allow free trades of the iShare Core ETFs as I currently do with my brokerage account? Can you just rollover pretax contributions into a Roth account and therefore effectively perform Roth contributions that way, since they do allow rollovers? I wonder which ones have account closure fees in the event that you don’t like the plan. Sorry, I just in your post above that Fidelity does offer commission free ETFs in this account, but it is unclear to me still whether rollovers can be made from the account to a Roth. Fidelity doesn’t offer a Roth option. I believe you can at Etrade, but confirm with the company. Thanks for this advice. Great article. I currently have a solo 401k and have the funds held at a local bank. I want to invest both traditional and roth contributions in those accounts into a brokerage account for a few brokerages (optionhouse, schwab, td ameritrade) so I can take advantage of each brokerage’s competitive advantage and range of available investments. What type of account would I open at each brokerage to get this done? I see each show different types of accounts (brokerage, roth, traditional, and rollover) that can be open. I am unsure of the differences between each, and more importantly, how to get the funds from my existing solo 401k bank accounts to these new accounts. Would you be able to clarify or shed some light on this? Thanks! You need to open a solo 401k account at whatever firm you choose. You can then rollover your 401k to your new provider. Most firms don’t allow you to do it online (I’ve yet to see it – not saying it doesn’t exist). Which ever firm you choose, give them a call and they should be able to handle the logistics for you as well. Pulled the trigger on TD Ameritrade, they seem have all the benefits I’m looking for. Ability to rollover from employer later on. Called Schwab before reading this. They said they allow a rollover from an IRA into a Solo 401k. The rep called his retirement dept while I was on the phone to confirm. My IRA is already at Schwab, that could be the difference. I’m interested in the loan feature – that’s how I wound up on your page. Thanks for the post. Very helpful. I spoke w/ E-Trade; I have my accts at Schwab. E-Trade has the potentially more rewarding big-picture options as stated above, such as ability to contribute to Roth, and after-tax option w/ WHILE-THE-PLAN-IS-STILL -ACTIVE ability to convert the after-tax directly to a Roth – ON DAY 1, so effectively you can do a mega-Roth w/o waiting til you terminate job. BUT, they don’t accept all mutual funds from my pension that I potentially would transfer and rollover into the new 401k, and they don’t do any 401k IRS mandated stuff, legal paperwork, bookkeeping, advice, like e.g., Schwab would, so you better know what you’re doing or more likely get professional help to avoid major IRS issues! Thanks for sharing your experience. Schwab also won’t file your IRS 5500 if your plan assets exceed $250,000. They also won’t likely do much paperwork and definitely no bookkeeping for you. If you’re looking for a plan administrator that would do stuff like that, look for a service like Ubiquity. I’m looking at schwab (where I have my personal retirement accounts already) and Capital One Spark (they do roth and loans, but it is $125 to setup, $15/month of maintenance and 1% management fee as they pre select investments…). Is there any reason why Spark 401k is not included as major player in your comparison? I’d have loved to see it. Correction: The management fee is 0.75% annually. As I am considering contributing every month, this could be interesting as it bypasses the trading fee… Or am I missing something? We didn’t even consider Capital One Spark because it’s not a free plan, and it appeared limited in investments for paying a fee. If you want a free plan that you’re just going to invest in stocks and bonds, all of the plans in this article make sense. If you want to pay for a plan to do more, such as invest in real estate or hard assets, the paid plans at the bottom like mySolo401k make the most sense. Captial One Spark 401k appears to be an expensive option for trading stocks and bonds. You pay a setup fee, maintenance fees, and more. It doesn’t give you the flexibility of the paid plans, so why wouldn’t you consider one of the free plans listed? As for a management fee versus trading fees – if you know what you’re doing, management fees are always expensive. If you have $100,000 in your 401k, then that 0.75% is $750 per year! That’s also on top of your fund expense ratios. I highly doubt you’d exceed $750 in commissions on your portfolio, unless you’re trading over 100 times per year – which you shouldn’t be doing! Hey Robert, question for you since you went with E*Trade – do you have to pay a commission every time you deposit into a mutual fund? I’m looking at their information on the Schwab Total Market Index Fund – SWTSX (https://www.etrade.wallst.com/v1/stocks/snapshot/snapshot.asp?symbol=SWTSX) , and it says “Transaction Fee – Yes.” Just wondering if you know since you have your Solo 401(k) with them, would that cost $6.95 each time? Ah, darn. Looks like the expense ratios are quite a bit higher for the commission-free ETFs than the fund that I was looking at: lowest is 0.19% vs. 0.03% – at that difference in expense ratio, if you maxed out the employee portion of the 401(k) at $18,000, you’d pay $28.80 in extra expense ratio just in the first year for one of those ETFs. I’ll definitely eat the one-time trade fee over a repeating fee like that! But good to have all the details – thanks for confirming. Sure, but just remember that you’ll potentially rebalance 1-2 times per year, so your commissions could get higher depending on what you do. Very helpful article! Been looking for Solo 401k plan options and will be looking into all that’s presented here, especially the real estate options. I’m looking for the best Checkbook Control Self-directed Solo 401K, to invest in real estate, so to remodel and hold or sell properties. Which would you recommend for that purpose please? You need to look at the bottom three: Ubiquity, My Solo 401k, or Accuplan. Looking at their plan document, if I read it correctly, they only allow rollovers from 401(a), 403(a), 403(b), 408, and 457(b) accounts. Thanks for finding this out! We couldn’t. Maybe they’ve updated since we originally posted this. Either way, I appreciate the digging. Hi Robert, thanks for the article. Unfortunately, when I went to E*Trade to open a Solo 401K, there was no option. The chat person claimed that is the same as an Individual 401K, but I think it is not. Am I mistaken? Yes, it’s the same thing. You can’t do it online – you need to print the application and send it in. First, thank you for the article. I called TD Ameritrade and found out they charge about .75%. You mentioned it was free with 6.95$ per trade. This is not the case, you may want to update your article. TD Ameritrade also offers a large amount of commission free ETFs that you can invest and choose from. I don’t know who you called and spoke to, but my guess would be you spoke to a financial advisor that was looking to manage your money and charge you a fee for assets under management. You don’t need to go that approach if you don’t want to. Thank you. I see what you mean then. Will E*Trade still provide support for these manually added provisions? Looking to open my Individual/ Solo 401. i have read with great interest your article and am looking at a few options. My concern is I know little about investing, so i would want the option of managed or at least suggested investments to go with. while still keeping costs down. I do not have to worry about any roll overs, but loan option would be nice. Deposits would be weekly or Biweekly. given that fact who would be the top 3 choices? I’m leaning a bit towards TD. I did like Invesco, but without any management or at least suggestions, i think i would be in trouble there. I have a unique and exciting Q for you to enjoy my friend!!! I have + $100k not from my salary sitting in my bank account. I want to invest this in more entrepreneur actions and am also looking at multiple LLCs for different assets. Earlier I was speaking to a 3rd party solo 401k and I need to keep digging before I commit to him. I understand that in some corporatization U R limited by the imagination. What is the case here??? I really appreciate this article and everyone’s comments.. I mean LLCs, liens, online stores, etc from a solo 401k. If I ever slow down I probably don’t want to pay maintenance fees. I’d rather pay a grand up front. Anything I should know about taking loans out of the solo 401k? How long can you keep the loan; can you declare it as a loss if it doesn’t pan out? Or in addition to the check book can I use a credit card which gives cash back before immediately paying it off?? The most you can borrow from a solo 401k is 50% of the balance, not to exceed $50,000. The loan must be repaid in full within 5 years. If you don’t pay it back, it’s considered a withdrawal, and could be subject to tax and a 10% penalty. You can invest in these potentially – as long as they’re not your companies or LLCs. You can’t self-deal or invest in your own private company with your solo 401k. That’s why I’m here in the 1st place. Is there a way I can put personal money into a 401k and invest in my Amazon store, tax liens certificates etc?? You can just invest in these things like tax liens, etc. You just won’t be able to in the 401k. However, I strongly recommend not doing that. It sounds like you have a big learning curve still. I’d make sure that 90-95% of my portfolio is in index funds before thinking about diversifying into these highly risky assets. There’s a lot to unpack here. But basically, you can only contribute roughly 25% of your self employment income to your solo 401k up to the contribution limit – $18,500 for you and up to $36,500 employer/profit sharing contribution. So, your self employment would need to have a profit of at least $146,000 to potentially max it. The high limits are great, but they also require a high income. As for your fees, if you use a third-party company, the fees never end unless you move out of that company. That’s why, for most people, we think using the options listed above that you can DIY make the most sense. However, as you’ve learned, the options to invest in those are limited to paper assets. With a third party solo 401k, you can invest in a lot more options – as long as they aren’t prohibited by the IRS. My Questions are not packed so much as thrown into a trailer… but I’m really using your content to get bearings. If details like fees change I won’t whine or try to blame you like some folks. Oh okay my self employment will not always be that high. If I made $ but am not yet self employed what the heck do I call it and can I put it all there at the begining?? If you’re not self employed, then a solo 401k isn’t something you can do. However, you can do an IRA, and that contribution limit is $5,500. Hello Robert, these past few months I’ve drawn around 5% in a Invesco fund. Not so bad for some time as a 20 year old tire kicker to study a little. I have even more $ now that needs a home. I want to act on your advice on index funds like the lazy investor north American fund. It looks like some of them are paying under inflation 4%? That’s without student loan driving inflation! What are some good dividend index funds I wont Whoa! Do I need self directed fund under an LLC if I plan on drawing $ before I’m in my 60s? I will check back every once in a while to hear your thoughts. I love you guys keep spreading knowledge!! Your first bullet point on things to consider is does the plan allow Traditional and Roth contributions. What do you mean by this? For your elective contribution (up to $18,500 for 2018), you could make traditional (pre-tax) or Roth (after-tax) contributions to your solo 401k **IF** your plan allows you to setup a Roth version. As you can see in the comparison, some notable companies (like Fidelity) don’t currently offer a Roth Solo 401k. My husband, aged 64, and I, aged 60, are both self employed and have individual IRAs. We want to move them and set up to SOLO 401Ks. Additionally, an inheritance from the sale of my late father’s home will leave us with 300K to invest in the Solo 401s as we contribute the maximum amount allowed for each of us for the next few years. We know little about investing, do not need a Roth or the ability to take loans. What makes sense for our situation. First off, it doesn’t typically make sense to do a Reverse Rollover (IRA to 401k) unless you’re planning to do a backdoor Roth IRA. In which case, why don’t you want a Roth? Also, you can’t add your inheritance to your 401k. The only thing you can add to your new solo 401k is approximately 25% of your income from your business. A solo 401k is a great tool for your business, but it’s not a “single account for everything”. If you look at our chart and recommendations, we like both E*Trade and TD Ameritrade to open a Solo 401k at. Just wanted to share that your information about Vanguard is wrong. In order to have the $20/fund fee waive, you need to $50k in assets in a non-solo 401k account. The assets in the solo 401k will not count towards the $50k in assets. I stumbled across this website because I am looking for a new provider. I have well over $50k in assets in the solo 401k. I have twice asked Vanguard why I am being charged $20/fund, and even asked if the fee could be waived because of the assets in the solo 401k. I even mentioned I will switch providers if the fee cannot be waived. Both times, I got a standard cut and paste response. Extremely poor service by Vanguard. I am leaning towards Schwab, but need to do more research. It seems very daunting to transfer a solo 401k, but Vanguard’s refusal to waive the $20/fund fee even though I have over $50k in assets in the solo 401k is forcing me to do it. You should note that Fidelity does not accept electronic deposits for its solo 401k. That’s a deal breaker for me as I’m too busy to visit a branch or mail a check. Agree, there are so many negative complaints about the Fidelity 401k that is should not be presented in this article as a viable option. “Free” does not make it good. What’s the turn around time for opening a solo 401k? Any chance I could make this happen before the end of the month (Dec ’18)? It takes a couple of weeks. You can definitely do it, but it will be close and will likely require you get help at an office. “It appears that you can rollover a 401k into your Schwab solo 401k, but you cannot do an IRA rollover.”. Not true. I have rolled over my traditional IRA into my schwab i401k. My understanding based on various conversations with my CPA is I can contribute up to 100% of your wages, but the business can match only 25% of my contributions. Is that not accurate? Since I’m above 50 years, my plan was to take about $30k in wages to permit me to make $25k in 2019 contributions to the solo 401k, take an employer match of $6.25k and disburse the rest of the business’ net income as profit. That way I don’t pay employment taxes on the rest of the profit. Is there a better way to disburse business profit than this approach? You have two different aspects to consider: the employee contribution and the profit sharing/employer contribution. We’ll use the 2019 401k Contribution Limits for this. For 2019, you can do $19,000 for employee contributions, and $56,000 total. Since you’re over 50, you also get an extra $6,000, bringing your total to $62,000. Here’s where it gets tricky. If you are taxed as a sole proprietor or spousal partnership, you basically get 25% of net income. Since you’re not taking payroll, your solo 401k contribution is based on your net income. This is why I say roughly. There’s a calculation that you run to determine how much to contribute. But it sounds like this doesn’t apply to you since you’re giving yourself payroll. If you’re a single member LLC taxed as an S Corp, the S Corp rules are the maximum employer contribution is 25% of W2 wages. So, in your example, if you only gave yourself $30k in wages, your maximum employer contribution is $7,500. Meaning, even if you put the full employee side into your 401k – $25,000, you’d only get $7,500 more – bringing the total to $32,500. So, if you wanted to max out your potential 2019 401k contribution, you’d want to pay yourself a W2 salary of $148,000. That gives you a profit sharing contribution of $37,000. Then, with your employee contribution, you can max your 401k. I did a rollover into a schwab solo 401k. Twice. Once for me and once for spouse. Easy as pie.